After winning two pro tours, Mono Red was on top of the world despite still being dogged by many pros for being a simplistic deck. Whether they liked it or not, Red Aggro was a competitive option that had to be respected as a Tier 1 archetype like it has been at many times in Magic’s history. But that all changed with Shadows over Innistrad. Shadows brought with it powerful Green and White cards that supplemented the already great suite from Dragons of Tarkir and BFZ block, and Mono Red’s run clearly came to an end. Results dropped like flies, and on our Red Deck Podcast we scoured all over the web and with listeners to try and find a sign of hope. I tested with my team, Mox Mania, at the beginning of the format with just about every conceivable variant I could think of against all of the new Tier 1 strategies, but there just wasn’t a build that could stand up to everything at a reasonable level. Part of this was the renewed strength of Green, White, and Black, but the other part was what we lost. Lightning Strike, Eidolon of the Great Revel, and Goblin Rabblemaster to name a few were so good at what they could do. Instead, we received mediocre and unplayable replacements. We received tease cards like Sin Prodder where it looked like an excellent option, only to have us reminded quickly that Reflector Mage and company still run the show. And that’s not to even say that cards like Prodder are bad news, in fact to this day I still believe there are proper shells for him, but ultimately there are many drawbacks which can’t be overlooked. In a way, it’s a blessing because it forces us as Red players to scrutinize the cards more carefully and make sure that our overall build makes sense. So Whats Changed, And Why Are We Playing Red? If you play with or take one look at a deck like Bant Company or GW Tokens, it’s easy to see why it’s appealing. Every card in each of those decks is powerful on its own, late game engines that run into infinity. I might love Red cards, but as a longtime Magic player that has wanted to be on the Pro Tour since he was a kid, I’m not ignorant of what else is available. Cards like Reflector Mage and Collected Company are not only sweet, they’re truly impressive from a game standpoint. For this reason, whenever I do testing I always make sure to run through each of the Tier 1 and 2 options as well, just to be sure I know what they’re doing and what they’re capable of. This is obvious to most high level players, but maybe not so much to most Red players or most casual players on the cusp of their tournament career. Approaching SCG Regionals, people (including many Red mage comrades), largely believed Red was still very dead. We saw the likes of Secret Burn by Max McVety (SCG Invitational Humans winner) in the first Open with Eldritch Moon to try and give us hope, but even he said the deck wasn’t great in an ongoing Reddit conversation. I tested the deck a lot, along with friends, and while it still attacked from that all important axis that is hard to fight, it felt like something was missing as the games were still too close and didn’t seem to have any leverage points. Also Dromoka’s Command and Ojutai’s Command were truly punishing. It was clear though that McVety’s list wasn’t finished being tuned, so I tried a number of things along with other people who are still working on it. I haven’t shelved the concept entirely, but it needs some tweaking. And playing Bant is easy game. Who wouldn’t want to play Sylvan Advocate into Reflector Mage into Collected Company into Spell Queller and sign a match slip. 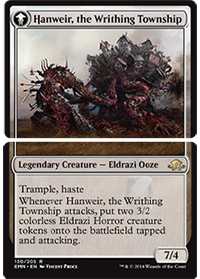 Or as the PT showed us, emerge an Elder Deep-Fiend into an Emrakul and take someone else’s turn. I love Magic, and I won’t deny that this stuff is cool, and is pretty amazing to behold. But damn son, I want my lunch break. And I want my opponent dead now. Origins Red was where this needed to start. Mono Red Aggro doesn’t just show up as an easy option. The cards look like crap, and anyone who plays at a competitive level sees a Dragon Fodder and laughs at why someone who wants to win a tournament would use their two mana on that versus something like Duskwatch Recruiter. The answer is synergy, free win potential (FWP), and playing without both a target on your head as well as capitalizing upon decks that do have one. I was mostly planning to play Red for Regionals anyway, but there was a chance I would borrow something else. Seeing the PT results breathed a bit of fresh life into things, as it looked like the format would get even slower. New set with people trying new ideas combined with a slowdown in the format is always the perfect time for Red to strike. Eldritch Moon also brought us some new weapons, and both their appearance and testing deemed them to me to be real. That testing, our recent Podcast guest Austin Casey’s build, and Todd Anderson’s work, all made me a believer that there was room here. We could get underneath Bant and GW, we could control the creatures on the board vs Boss Humans, and we could race the Emrakul decks. The secret though was in playing style. Austin mentioned some great points on the Podcast about baiting your opponent into removing or countering your early plays so that you could capitalize with a later play (such as Chandra, Garrison, or Thunderbreak). Additionally, he talked about being observant of your opponents’ behaviors, their open mana as any good player would do, and just “taking a turn off” when you need to. Force them to play their Queller early or on something irrelevant, or their Avacyn when you simply pass turn to coax them into believing their advanced board state is the route to victory. These kind of situations came up a lot during the tournament, and I was able to punish my opponents as a result with the plethora of burn spells available to take down a Queller and get my original spell back or lead them into tapping out and then slamming an Impetuous Devils to make them reel back in their seat. You also simply start the game before they do, leading with one drops into burn backup while they have a turn 1 tap land. Classic Burn vs Midrange battle. I mentioned drawing on Origins earlier, and that was indeed where this began. We already knew Abbot and one drops were good, especially when backed up by a similar suite of Burn spells. Being able to clear the road or have finishing reach was of the utmost importance, and this was a big reason why I have the full 12 Burn spells. Galvanic Bombardment might seem out of place in a field of x/3s, but there are still very relevant targets like Thalia, Heretic Cathar, Duskwatch Recruiter, any of the Mono White Humans creatures, Hedron Crawler, etc, etc. And since we’re only playing 12 Burn spells, getting spell mastery for Fiery Impulse isn’t easy, nor does that have the option of occasionally killing an Avacyn or Ishkanah as the game gets late. Galvanic Bombardment is also great at leveraging the deck’s tempo advantage, allowing you to double spell often and combine with other Burn to get a truly significant threat off the table. There will just be many situations where you have three mana and want to both play a 1 or 2 drop along with holding up Galvanic Bombardment to kill the creature they play on their turn. These types of situations can’t be overlooked, as they’re how you beat decks looking to overpower you past the first few turns. The other historical place I looked was one of my own decklists. Back when I started this website, I was on a tear with a Mono Red Aggro build during the heyday of Junk Rites (another grindy midrange deck), Mono White Aggro, and Jund. I put up a huge amount of tournament wins with that deck, featured in my original article. While the cards today aren’t the same, the curve and land count could be relied upon, and a lot of the new technology mimic’d the old ones well. In fact, while cloning is not usually wise, the new cards were finally close enough that in this instance I think it made good sense. Impetuous Devils is absolutely no Hellrider, but he still hits harder than most Red cards can, and he often can be a removal spell for you too, which numbers wise brings you up to 16 in the deck if you’re counting him. Chunking your opponent for a few points of damage and potentially clearing their Sylvan Advocate or Gideon + Token is a strong play. Reckless Bushwhacker + Dragon Fodder is the most notable omission from my list, and this is where Impetuous Devils and Village Messenger came in. Devils accomplishes much of what Reckless Bushwhacker + Dragon Fodder want to do, but it does it in one card. Both sets of cards also have similar weaknesses, such as Thalia, Queller, and instant speed removal (albeit Devils is worse versus the latter). But if we’re looking at these cards truthfully, we’re only playing them when we can capitalize on our opponents plays, and that’s often when they’re tapped out or exhausted on available resources. Both Reckless Bushwhacker + Dragon Fodder and Devils are the kill strokes, so you need to make sure they’re going to do that job before you decide to play them at all. Village Messenger is not as obvious. The main reason I wanted to play him was due to the interest in staying hyper-aggressive game 1. In my old list, I had Rakdos Shredfreak and Ash Zealot. We don’t have any two drops like that anymore, so Village Messenger fills the role, and when flipped can be very irritating for your opponent. In a format where many opponents are playing tap lands and a plethora of three drops but not as many twos, Village Messenger actually can flip a good amount. And in the matchups where he’s bad, or where you’re on the draw, you can simply side him out (which is often the gameplan). But most importantly, he brought the list up to 13 one drops, which is just 1 card shy of the probability threshold of getting a one drop in your opening hand the “majority” of the time. He’s probably the most questionable card in the list, and I could see cutting him to go a little bigger, but he filled his role appropriately on the day. Hanweir Garrison is a fascinating card. Yes, he’s like Goblin Rabblemaster in design, but he’s also so much different. He’s a 2/3 in a world of 2/3s, so he actually helps you block sometimes (or simply attack when you wouldn’t have been able to with a Rabblemaster), and his tokens despite attacking the turn they come in don’t have to later on, so you can conserve your resources if they manage to get Papa Garrison off the table early. What’s most significant though is the Meld ability. I found myself in a few situations in the tournament where I was essentially dead. No way to win the game unless I lucksacked into 3-4 burn spells which wasn’t a likely scenario with my opponent having the advantage in the game. 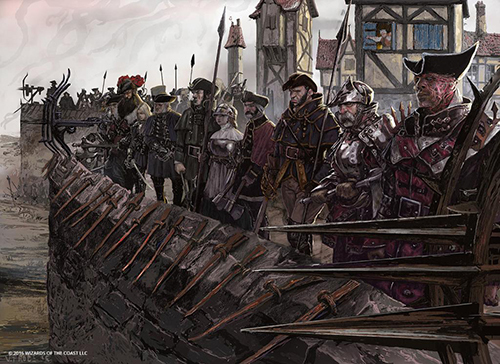 But Melding Garrison with Battlements COULD win me the game in those spots, as a 7/4 trampler who makes huge creatures can overcome a lot of board states that the Tier 1 decks present. And it happened, during a match with Bant Coco where he had 3-4 creatures on the board but I drew into the Battlements I was banking on and unleashed the monster. Yes, all of his sides are still Reflector Mage-able, but that’s just a one turn delay and the argument of “dies to removal” doesn’t invalidate completely the power a card may have. The sideboard is mostly straight-forward. The Thunderbreak + Draconic Roar + Land package was borrowed from Todd Anderson’s articles, and is essentially the go big plan post-board vs Bant CoCo and to a lesser extent GW Tokens (it’s still correct to stay a smidge faster vs Tokens). You cut Village Messengers and Lightning Berserkers (as outlined by Austin on our Podcast), and then if you’re on the draw you can cut some or all of the Impetuous Devils. On the play, I’d trim on some combination of Garrisons, Abbots, and Devils depending on how you feel or your opponent’s list. Devils and Garrison as mentioned before aren’t great versus Reflector Mage and Spell Queller, and since they’re towards the top of your curve they’re where you’re forced to make some concessions. The go big package is really nice versus them, because while you still want to maintain your speed advantage (and don’t be afraid to mulligan for a more aggressive keep if you need to), Roar and Thunderbreak allow you to clear more blockers and present ones of your own. If they are able to break serve with you, Thunderbreak generally puts a halt to this, and allows you to start swinging the pendulum back towards you being the aggressor. Their fliers are smaller, so it then becomes a battle of you drawing burn spells versus them drawing CoCos and Mages, of which you have far more burn spells. Selfless Spirit is probably the biggest concern in these spots, so make sure to prioritize killing him early when possible. There’s many games with the go big plan where you just overrun them too. One drop into two drop or burn spell, into Garrison, into Thunderbreak is pretty impossible for most of the decks in Standard to deal with. Several of my Bant opponents saw this and were so far behind that even a good CoCo hit couldn’t get them out of the hot water. A Dromoka’s Command is never too clean versus Thunderbreak, and the 3 damage usually matters when it’s coming after your early aggression. I’m considering moving the package to the maindeck, but there’s still a big part of me that wants to stay as aggressive as possible game 1, as this is critical to beating the new Pro Tour decks and keeping pace with Boss Humans. The sideboard is rounded out with pairs of other cards. Act of Treason helps you against any deck that durdles for a while before landing one big roadblock, whether it be a delirium Emrakul deck or a Worldbreaker Ramp deck. Certainly not great against Ishkanah, but there will always be decks in any meta where this type of effect is wanted. Twin Bolt is for Aggro mirrors, most notably Humans where they might get ahead of you onboard but are a deck full of X/1s. It’s also just nice to have another instant speed Burn spell and one that is inherently setup to create 2-for-1s as well as go to the face. You may even want to bring it in versus GW Tokens, but that would be very build dependent and also dependent on how you prefer to play the matchup. Chandra, Fire of Kaladesh is for decks that barely interact with you. Non-Red ramping decks (or even some Red ones if you can bait out a Kozilek’s Return first), Humans, and GW Tokens. It’s very easy to flip her the turn after you play her in this deck, so you put these archetypes in a position where they need to have their limited amount of removal or they’re facing a card that’s far more powerful than most of their options. Chandra wins most games where she flips, and it’s easier to get them to fire off their removal spell before she lands when you’re running tons of low to the ground threats prior to her arrival. You’re already a deck that Control decks don’t want to see, with the one caveat being their ability to Languish and Lifegain. You play around these as best as you can, and post board you cut non-damage or low-output cards (Galvanic Bombardment, etc) for more threats. Generally that means bringing in Thunderbreak Regent, as while it dies to Languish it’s still an annoying threat for them and one that lines up against a lot of their creatures such as Avacyn and Kalitas. You’re playing the cat and mouse game here, hoping to not overextend, bait a Languish, and then punish them with Devils or Lightning Berserker. You’ll want to be conscious of Exquisite Firecraft, as it’s often the linchpin card vs any flavor of Control deck (counters or not), and killing things like Kalitas, Gisela, or Thalia’s Lancers with it is very pertinent. Act of Treason is another card that can be outside considered for the Control matchups too, as they are yet another deck that generally has one creature at a time on the battlefield and that creature is often both a roadblock and your end game. Hopefully this article outlines the thought process well regarding my choices and possibilities for future direction with the deck. I think if anything, I’d like to either add the Thunderbreak package and/or get lower to the ground with the build. Everything was clicking at the tournament for it, and generally the games I lost were to mistakes I made or the usual things for Mono Red (land flood, being 1 removal spell short, etc). Bottom line, the archetype is back and in a big way, don’t believe the naysayers.